Four little girls were changing into choir robes and chatting in a church restroom preparing for the Youth Sunday services at 16th Street Baptist Church in Birmingham, Ala. on September 15, 1963. At 10:22 a.m., a bomb previously hidden under the church steps with its timer deliberately set to go off during Sunday morning services exploded. Three 14-year-olds – Addie Mae Collins, Carole Robertson and Cynthia Wesley – and 11-year-old Denise McNair were killed on that morning. Addie loved softball and drawing. Carole was a straight-A student, a member of the Science Club and the Girl Scouts, and played clarinet in the school band. Cynthia played clarinet too, along with piano, and dreamed of being a teacher. Denise, the youngest, was excited about singing in the youth chorus. Addie’s younger sister Sarah, also in the restroom, lost an eye in the bombing. She remembered Denise had just asked Addie to help her tie the sash on the back of her dress when the bomb went off. For 14 long years, there was absolutely no justice. A 1965 FBI investigation confirmed White supremacists and Ku Klux Klan members Robert Chambliss, Bobby Frank Cherry, Herman Frank Cash and Thomas E. Blanton, Jr. as the suspects, but it was not until 1977 that Chambliss was tried and convicted of the first-degree murder of Denise McNair. The girls’ families suffered still another quarter century of injustice. Herman Cash was never tried for the murders, and died in 1994. Finally, the families’ agonizing wait was over when Thomas Blanton in 2001 and Bobby Cherry in 2002 were finally convicted of four counts of murder and sentenced to life imprisonment. Blanton and Cherry had walked free for 39 and 40 years respectively before being brought to justice. Chambliss and Cherry died in jail. This August 3, Thomas Blanton will be eligible for his first parole hearing after serving just 15 years of his four life sentences. He bragged about the murders for decades before his conviction and never expressed remorse for his actions. Dr. Martin Luther King, Jr. described his despair saying that if men could be that bestial, maybe there really was no hope. A loud chorus of voices are joining together to say any parole and release would not be sufficient justice for the murder of four little girls. Justice requires Thomas Blanton serve the rest of his life in prison. 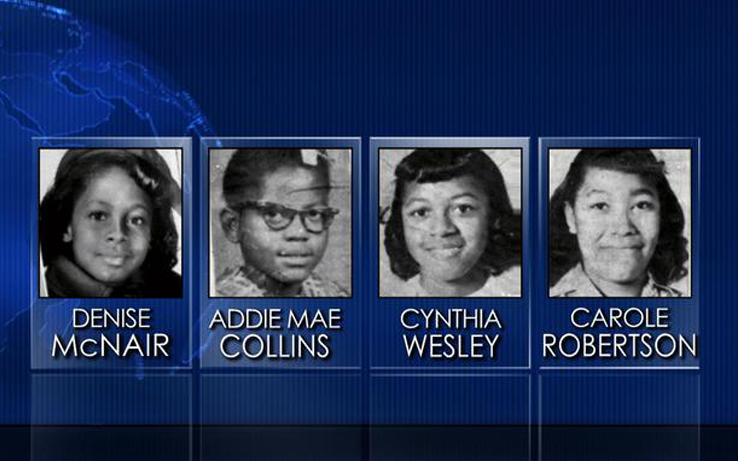 An early release would signal how little the lives of four precious little Black girls mattered to their killers in 1963 and in 2016 America. Carole Robertson was deeply involved in Jack and Jill of America, a family organization founded by Black mothers to instill values and leadership skills in their children. Jack and Jill chapters honor Carole every September with educational and social programs about civil rights, human rights, and racial harmony. This year, Jack and Jill mothers across the country are joining surviving family members and others in the #Justice4Carole campaign, writing and calling Alabama’s Board of Pardons and Paroles demanding minimal justice for these child lives snuffed out so maliciously, and that parole for this “unrepentant racist” and “vicious mass murderer” be denied. I strongly oppose capital punishment that Blanton and his evil co-conspirators so viciously inflicted on Addie Mae Collins, Denise McNair, Carole Robertson and Cynthia Wesley because they were Black. But I do support punishment that at least tries to proximate his heinous crime. This unremorseful prisoner snuffed out four sacred child lives and escaped punishment for decades. He should die in prison for his inhumane atrocious crime.